Photo: The Learning DM You’re trapped in a rank dungeon, the air thick with decay. Suddenly, a gorgon appears, leering malevolently, hungry for your very flesh. One of your party decides to rush the horrid beast, charging with tremendous speed and... hits a wall, bounces off of it and comes to a stop a hundred feet on the other side of the monster. Welcome to Catacombs. 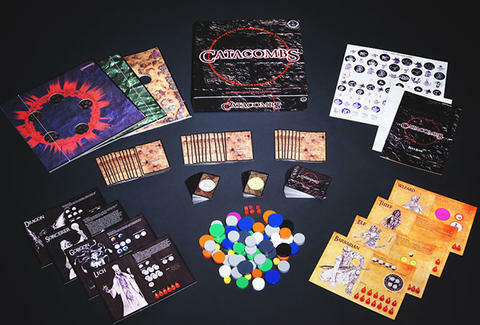 A fresh take on dungeon crawling, Catacombs turns your fingers into instruments of doom. Instead of drawing cards to attack, you flick tokens at your enemies. Instead of rolling dice to move, you flick your token down the game board. And at long last, all those hours training your finger football skills will come in handy. Looks like you did learn something useful in math class after all!